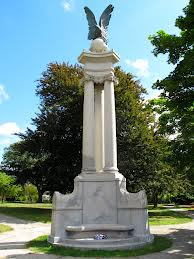 The Civil War Monument at Whitinsville's Memorial Park, is the embodiment of a conception first suggested by the sculptor, Mr. Herman A. MacNeil, and later developed by him and his associate, Prof. A. D. F. Hamlin of Columbia University, who elaborated the architectural design of the monument. It consists of a triangular pedestal, with slightly concave sides, resting upon a circular step or platform, and flanked at the three corners or truncated edges by projecting buttresses. Upon the pedestal stand three columns of the Ionic order, supporting an entablature with an enriched cornice, whose tapering roof bears upon its summit a globe surmounted by a bronze eagle. The height of the pedestal is 7 feet; the columns are 13 feet and 1 inch in height, and the top of the stone globe 5 feet and 1 inch more in height, while the additional 6 feet of the bronze eagle make the total height of the monument above the platform 33 feet, 7 inches. Upon the front of the pedestal which is turned towards Main street, the sculptor has carved, in very low relief, a figure of a youth, girded with a sword, and resting with one hand on the shield of the Union. 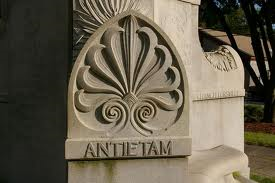 Laurel wreaths and an inscription are added, the whole composition symbolizing the devotion of the youth of the land to the memory of their fathers who fought for the Union, and to the land and the ideals for which they gave their lives. Upon the other two faces are the names of the 39 men of Northbridge who died or were killed in the war of the Rebellion. * note: David Casey died some years after the war. He is the Town's only Medal of Honor recipient. The three buttresses are so shaped as to form Greek steles or memorial stones surmounted by the Greek honeysuckle ornament, a common funeral emblem of the people in ancient days. A carved arm rises from the stele-head to the pedestal, carved with the victorious palm, which is also the symbol of martyrdom. A band on the front and sides of each buttress, beneath this arm, bears the names of the important battles in which the men of Northbridge lost their lives. 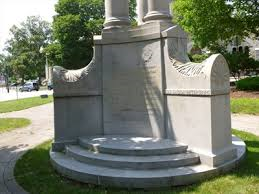 The three columns like the rest of the monument, are of fine white Connecticut granite from the Waterford quarries near New London, Ct, finely tooled and capped by Ionic capitals of the four-faced or Roman type, sometimes called “Scamozzi capitals." The entablature (architrave, frieze and cornice) recalls certain details of the propylaea at Eleusis, but nowhere is there close copying of any ancient structure. Each part to the smallest moulding, has received special study in its relation to the purpose, scale and spirit of the whole. The stone globe supporting the eagle is 2 feet and 8 inches in diameter. Three rich acanthus leaves curl up against it from the roof. The eagle that has alighted upon it, holds in its claws an olive branch, emblematic of peace, and stands with poised wings, gazing into the distance, the symbol at once of the United States and of its imperial power on the earth, with its gaze fixed upon the future, while it is upheld immovably by the triple pillars of religion, education and patriotism. The efforts of the designers have been throughout to produce a monument completely significant of its purpose, refined in treatment, and alike free from ostentation and commonplaceness. Mr. MacNeil's eagle, modeled from a living American eagle in his possession, is as vigorous and powerful in its realism as his relief of the young American, girded with his father's sword, is delicate and tender in its idealism. The work of carving the monument was faithfully and admirably performed by Messrs. Booth Brothers of New York and Waterford, under the direction of Mr. James Adamson, and the monument was set up by Mr. Henry A. Langtry of the same firm.